I really had been looking forward to this rally for some time. Yet the morning of April 15, I still had a moment of hesitation whether I should attend. This was, after all, the first protest rally I had ever attended. I’ve never been involved in politics before but during the 2008 election I felt I had to, in some small way do something. So I started this blog. People are being misled by candidates, politicians, the media and education. Historic and economic truth was and is being drowned out. Now 100 days into the new administration not only has nothing changed, it is worse. The Tea Parties were a way to do something more and build from there. I didn’t know what to expect, would there only be a small number of us? As I drove around looking for parking there were a lot of parked cars and the parking ramps were full. I thought it couldn’t possibly be all these cars were here because of the anti-bailout rallies? After I found parking, I had to walk a considerable distance. It wasn’t until I saw people carrying signs that I believed all these people walking were Tea Party protesters. I couldn’t believe how far away I was when I first heard the cheers of the crowd. It was quite loud and impressive. The amount of people I saw when I got to the capital was a great surprise. My first protest was great, I had a good time. America is a great country. We are truly blessed to be here, even if things don't look so good now. It was a great day, great weather, with great American patriots from all over. I was able to work my way through the crowds. People were polite and friendly. Such a diverse rally here at the steps of the Michigan capitol building; so many young people, children, college kids to senior citizens and families. This was a genuine grass roots rally of hard working Americans. The state police were friendly; chatting with the people. After the rally about fifty volunteers stayed after to clean up the area. The Democratic mayor even said there should be more protests because they bring business to the downtown area. If the protests were violent he definitely would not be saying that. There were a lot of people who protested for the first time today, that really means something. It should be a lesson to all that something is wrong in D.C. These Tax Day Tea Parties are not a republican thing. They’re about conservatives, libertarians, independents, moderates; Americans fed up with bailouts, irresponsible spending, trillions of debt, corruption, hypocrisy and dishonest politicians only serving themselves with no accountability. Americans fed up with out of control spending and taxing at all levels of government; local, city, state and federal. It’s about this administration and congress choosing to ignore history by pushing their own agenda of piling on trillions of irresponsible spending that will increase job loss, prolong the recession and undo the American economic engine. It’s about a government that is taking away the ability of the people to help each other; a government causing the poverty and oppression of its citizens. We want both parties to know, they serve us, they are not above the constitution and incompetence will not be tolerated. These Tax Day Tea Parties represent an America that understands economics better than this Administration and Congress. These rallies are getting more people involved in the political process. I am glad I could be a part of America’s awakening. I can’t help but ask, like I am, how many are energized by fellow patriots you rallied with? How many feel you just need to be more involved? 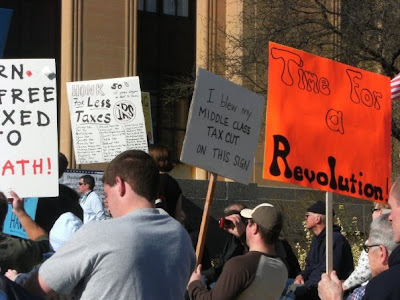 On April 15, 2009 hundreds of thousands of people from over 800 cities, in 50 states attended the Nationwide Tax Day Tea Party. We had 5000+ here in Lansing, Michigan; it was from 12 Noon to 1:00 PM. Michigan had 34 Tea Parties with 19,578 total attendees. According to PJTV, the official count is 832 events with 935,504 in attendance of the nationwide Tax Day Tea Party. There were events held the weekend after and there are links below for events in April, May, June, July and September. PJTV attendance totals, top events, top states,view by state, by map, logs and event information. See all events & totals with photos, video, etc. See future events as well, filter by state. Photo by Sandy G (Great Sign) I blew my middle-class tax cut on this sign. Rescue America! Stop the economically illiterate! Raising taxes is not a spending cut! Are you registered to vote? Check and make sure you are. Find 5 people to register. Become involved! Find out what you can do to help Rescue America. Local grassroots. Do what you can. It all makes a difference! Ever Get the Feeling the American People Are Going One Way and Obama Is Going Another? To Learn more about the assault on jobs & achievers, see the Economics & other sections above. Is It Wrong To Learn From History? Financial Crisis: Is Anyone Telling Us the Truth? 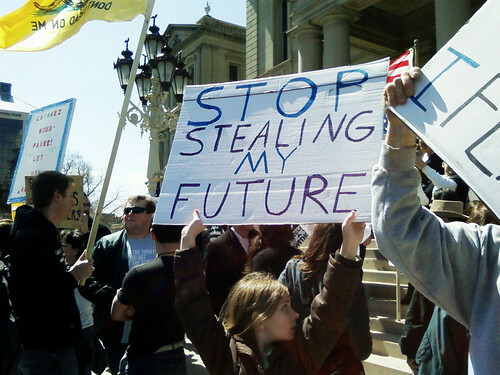 Taxes, Taxes, Scandals and The American Dream? I hope this blog will cause people to think about these issues in ways they haven't in the past. I encourage everyone to clear their minds and study every issue for themselves. It is just too easy to be misled by everything and everyone these days. Learn how things work, study economics, study and learn from history and from our mistakes, study current events, study governments around the world and even our own states and cities, study the results of solutions and policies to see if they are helping and not making things worse. It is important to put aside ideology and have a basic understanding of economics as you study history. It is my goal to bring out truth so the reader will have understanding and come to their own conclusions based on truth.